Racing’s luck pendulum swung in Philip Hobbs’ favour when Massini’s Maguire won the opener on day two of the Cheltenham Festival - it was a dramatic change in fortune following a miserable first day for the Somerset-based trainer. Hobbs said: “We thought yesterday we had our best two chances of the week by a long, long way, and having seen them beaten we thought that was the end of this year’s Cheltenham - and now we’ve won the first race on the second day. Owner Alan Peterson was also gaining compensation following the defeat of his Fair Along in The Irish Independent Arkle Trophy yesterday. Hobbs said Fair Along will be back at Cheltenham on Friday for the Vincent O’Brien County Handicap Hurdle, while he also had news of Detroit City, beaten favourite in yesterday’s Smurfit Kappa Champion Hurdle. Massini’s Maguire is a chaser for the future, added Hobbs, who said Aintree would be his next target. 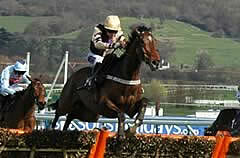 Cashmans Bookmakers rate Massini’s Maguire a 20-1 shot for next year’s Royal & Sunalliance Chase. The winning rider Richard Johnson: “He's done it really well. It's amazing what [difference] a day can make - yesterday didn't really go well. “He's had some on and off days really, but he's produced it on the right day. The run-in seemed a very, very long way. You always want the winning post to come when you're in front up this hill. “It shows the ground has probably dried up, and we've ended up making nearly all. He's a real, brave little horse. He's won twice round here now and seems to love the hill." The Howard Johnson-trained Tidal Bay battled on to finish within in a neck of long-time leader Massini’s Maguire in the opening Ballymore Properties Novices’ Hurdle. “He came up the hill well and in another five yards would have had the winner,” said Johnson. Noel Meade, the trainer of the 5/2 favourite Aran Concerto who finished fifth, reported: “He was very disappointing. Tony (McCoy) said Aran Concerto did not settle and he felt, if he rode the horse again, that he would have him up with the leaders or walk him out of the gate (hold him up). “Tony said he was in the middle and the horse would not relax - tanking along. Aran Concerto stumbled after the second last hurdle. Tony described him as very babyish. A Stewards’ Enquiry was held after the running of the Ballymore Properties Novices’ Hurdle under Rule 171 (3). The stewards looked into possible interference caused by the second, Tidal Bay, to the third, Catch Me. It was held by the stewards that the interference was accidental and that Tidal Bay had not improved his finishing position. No further action was taken. 1. The Ballymore Properties Novices’ Hurdle was introduced to The Festival in 1971 as the Aldsworth Hurdle. Sun Alliance, who merged with Royal Insurance in 1996, took it on in 1974, together with the Sun Alliance Chase, having previously sponsored the Foxhunter Chase. Ballymore Properties sponsor the contest for the first time in 2007. 2. The Ballymore Properties Novices’ Hurdle, along with the new Brit Insurance Novices’ Hurdle and the Royal & SunAlliance Chase, are acknowledged as championship races for the staying novice hurdler and chaser. 3. Only one horse has won both the Ballymore Properties Novices’ Hurdle and the Royal & SunAlliance Novices’ Chase. The West Awake took the hurdle race in 1987 and the chase event a year later. 4. The smallest field for the Ballymore Properties Novices' Hurdle was 14 in 2000, when there were three non-runners. Previously the lowest number of runners was 15 in 1973, the year of Willie Wumpkins, who later dominated the Coral Golden Hurdle Final at the Festival with three straight wins from 1979-81. The largest field was 29, achieved in 1979, 1984 and 1991. Last year there were 17 runners and the safety limit is 24. 5. The Irish-trained 1994 winner, Danoli, was the subject of a massive gamble and was sent off the 7/4 favourite. The shortest-priced winner was another Irish victor, Mr Kildare, at 8/11 in 1978. Favourites have been successful in 12 of the 35 runnings. The longest-priced winner was 40/1 chance Even Dawn in the second running in 1972. 6. Five of the last 18 winners won the Blue Square Novices' Hurdle at Warwick in mid-February en route to the race. These are Rebel Song (1988), Sayfar's Lad (1989), Thetford Forest (1992), Putty Road (1995) and Monsignor (2000). The Warwick race was abandoned in 2006. 7. The Irish have an excellent record in the Ballymore Properties Novices’ Hurdle with 13 wins, including six consecutive victories from 1973-78. Nicanor, trained by Noel Meade, scored for the Irish last year when upsetting hot favourite Denman. 8. Aidan O’Brien, Martin Pipe, Oliver Sherwood, Mick O'Toole, Edward O'Grady and Nigel Twiston-Davies have each won two Ballymore Properties Novices’ Hurdles. Oliver Sherwood and Dessie Hughes are the two trainers to have also won the race as jockeys. Sherwood was in the saddle on Venture To Cognac in 1979, while his training wins were with The West Awake (1987) and Rebel Song (1988). Dessie Hughes was twice successful as a jockey with Davy Lad (1975) and Parkhill (1976) and sent out Hardy Eustace (2003) to victory as a trainer. 9. The fastest time for the winning horse was 4m 52.0s set by Monsignor in 2000,beating the 4m 56.2s of Regal Ambition in 1990. 10. Istabraq (1997) and Hardy Eustace (2003) both won this race en route to victory in the Smurfit Kappa Champion Hurdle while Davy Lad (1975) went on to take the totesport Cheltenham Gold Cup.